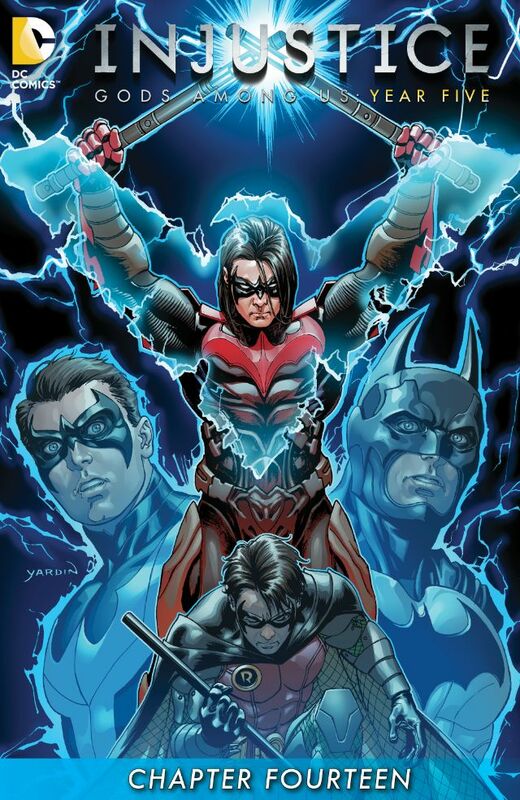 Nightwing (Damian Wayne) seeks to apprehend a group of escapees on his own, and overestimates his abilities. Deadman (Richard Grayson) comes to his rescue by possessing one of the escapees and Damian is returned to the Hall of Justice. Damian tells Regime Superman of his conversation with Alfred, and while Regimes shows no ill emotion with Damian, his face is one of anger as he walks away. Story - 1: Damian has had the spotlight for a wee bit now, and failed to move the needle with this critic. It is possible to be troubled, pensive, and all the rest, and still not be so flat out stupid. Damian has allowed Catwoman and Harley Quinn to escape, because he needed someone to chat with more than he needed to get the job done. He could have apprehended all of the escapees, as he had the element of surprise, but squandered it for no good reason. Fiction seems to have a low estimation of people, most of whom are able to balance a conflicted mind or heart, and still do the jobs, parenting, etc., that needs to be done, and do it well. One would think that Damian, who is trained to master his emotions and be disciplined, would put on a better show. Such is Injustice. Art - 4: I've seen that look on Regime's face before, and while I like it, it's come to amount for nothing. Cover Art - 3: The son of the Bat impersonates the true Son of the Bat.